MSRP or Price does not include $870 in destination charges. Seems like we all have to work harder and harder every year. And those hills don’t seem to be getting any flatter, or the trails any smoother. But one thing is getting better and better: Honda’s line of Pioneer side-by-sides, especially our top-of-the-line Pioneer 1000 family. What sets them apart? Smart technology. Superior materials. Refined engineering. And something nobody else can match: Honda’s well-earned and world-famous reputation for reliability and overall quality. And the farther you go or the harder you work, the more that means. The 2019 Honda Pioneer 1000 lineup is a perfect example. 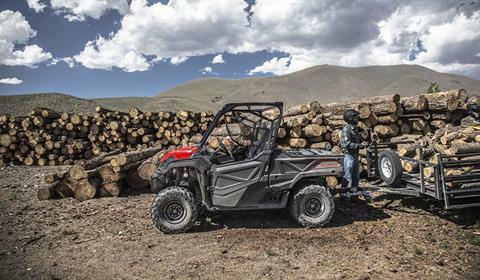 These great side-by-sides got it right the first time in terms of comfort, handling, hauling, and user-friendly features (and, check out the new colors this year). 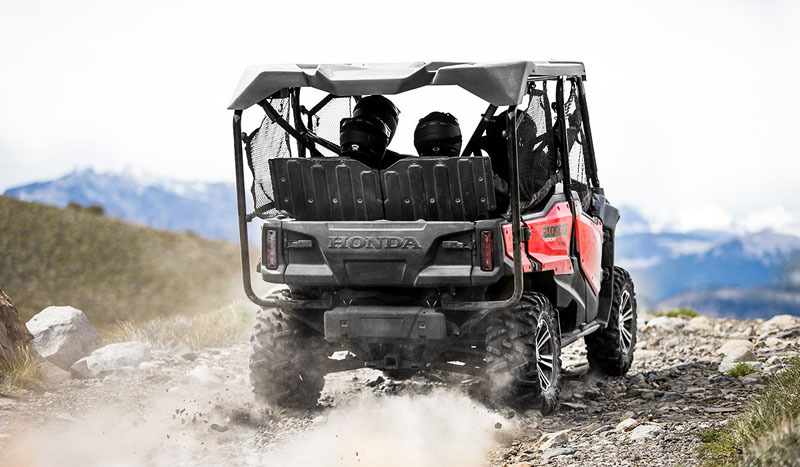 Available in both three- and five-seat versions, in addition to their innovative features, from our flagship Pioneer 1000-5 Limited Edition right through our line to the Pioneer 1000, you can count on a Honda, year after year, mile after mile, adventure after adventure. 3-PERSON CONTOURED BENCH SEAT: Tough, durable and built to enhance every driving experience — yes, we’re talking about the seat. Contoured for three passengers, the center seat is positioned up and forward to maximize space and comfort, and the covering is designed to resist both the elements and heavy use. LCD DISPLAY: The multi-function LCD dash display is large enough to host loads of information, in an easy-to-read way, like speed and fuel level. RPM and transmission mode. Fuel gauge, water temperature, trip information and more. It even includes a clock, so you’ll always know when it’s time for some fun. TILT WHEEL: With a tilt steering wheel, you’re ensured an even more comfortable driving experience. We’ve given the wheel a wide range of adjustments for optimum customization, and it even moves very far forward to allow for easy entry and exit. SOPHISTICATED CHASSIS: Some of the most impressive Pioneer 1000 features are those you’ll never see. In addition to the suspension and ground clearance, we rubber-mounted the engine and exhaust system to insulate the cabin against excessive vibration. So while you may not see this feature, it’s one you will definitely notice. 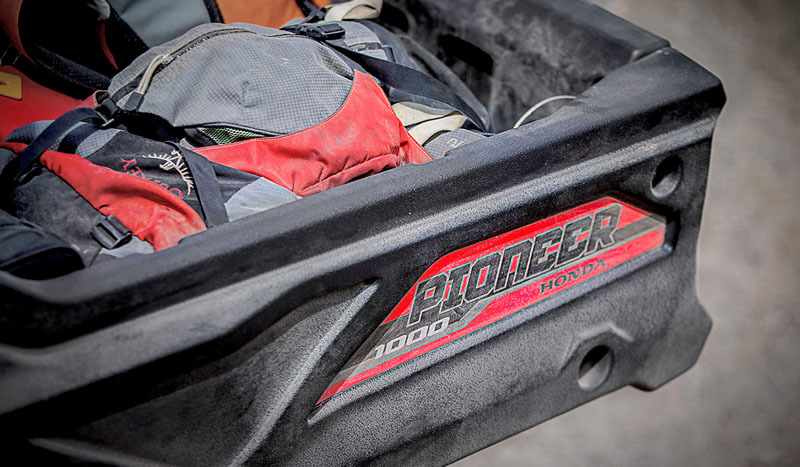 SELF-LOAD LEVELING REAR SUSPENSION: Even when you push your Pioneer 1000-5 to the limits, you compromise nothing. Just take the load-leveling suspension with cargo, passengers or both piled into the back — the rear suspension automatically adjusts to the weight change. So you maintain ground clearance, comfort and handling, without compromises. 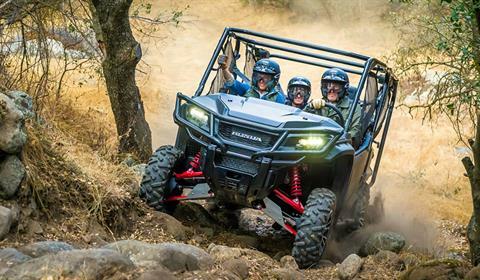 I-4WD: The Pioneer 1000 Limited Edition showcases our exclusive I-4WD system. Think “I” for “Intelligent,” because that’s exactly what it is. An industry-first brake-traction control system for side-by-sides, it simplifies operation, increases drivability and optimizes traction. 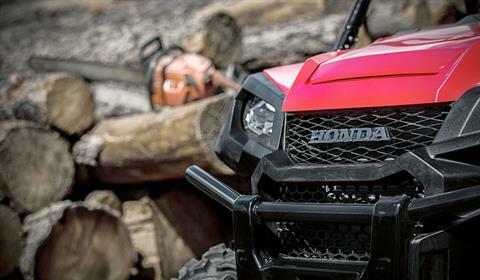 Using proven, advanced technology from Honda’s automotive division, you get the benefits associated with a locked front differential with none of the downsides. That means it maintains front-wheel traction even if one wheel wants to spin on ice or mud or if it’s in a hole. But at the same time, you get the lighter steering, better tracking at high speeds, tighter turning radius, and reduced kickback associated with unlocked front differentials. CHASSIS AND SUSPENSION: Prepare to go further than ever before. 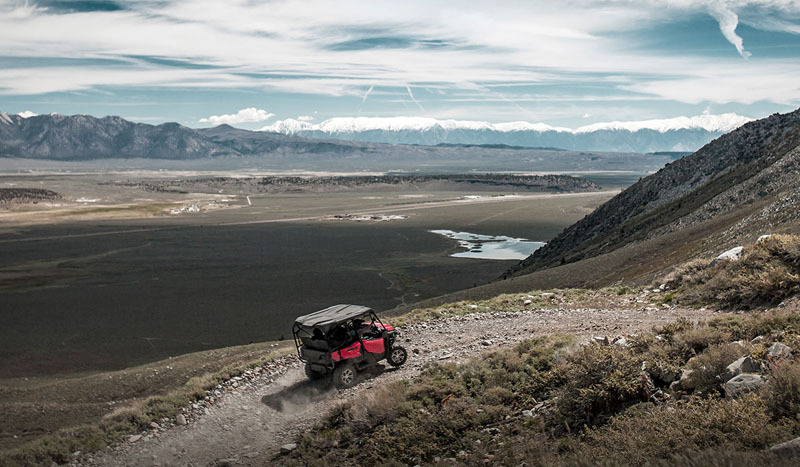 Our refined chassis enables you to tackle terrain others would shy away from, with larger tires, long-travel independent front and rear suspension and huge ground clearance. The rubber mounted engine and exhaust system insulates against excessive vibration, and on the 1000-5 model, self-leveling rear suspension compensates for changing loads. PADDLE SHIFTING: Steering column-mounted paddle shifters add a serious dose of performance in every drive. In Manual mode, they let you shift without ever taking your hands off the wheel, and in Automatic mode, they let you override the current gear with a quick up or downshift, holding that gear for several seconds before returning to Automatic mode. INDEPENDENT FRONT AND REAR SUSPENSION: Dual A-arm suspension gives you 10.5 inches of travel in the front, and 10-inches of travel in the rear. 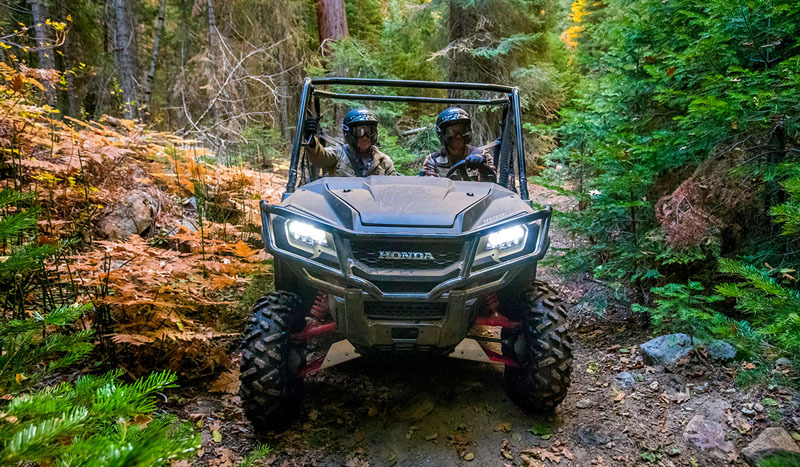 Pair that with stellar ground clearance, and you maximize available traction and superior comfort maneuvering over terrain other side-by-sides would shy away from. ELECTRIC POWER STEERING: Our Electric Power Steering system helps eliminate bump steer through rocky and rutted terrain, which reduces fatigue. What makes it even better is the added assist you get when you need it most, like when you’re in 4WD, driving at lower speeds, or maneuvering over rough conditions. BIGGER TIRES: Practically speaking, the 27-inch tires on 12-inch rims help increase ground clearance, improve ride comfort, and deliver better traction. Realistically speaking, they just look great. And on the DLX model, you get Maxxis Bighorn 2.0 tires with radial construction and premium style. ADVANCED TRANSMISSION LOGIC: The brain of the DCT, Advanced Transmission Logic, senses how you drive and adapts. Relaxed drivers get earlier shifts for a quieter ride at lower engine speeds. Sportier drivers will hold each gear longer for higher RPM shifts. And when going downhill, you get true engine braking. Now that’s a smart transmission. POWERFUL 999CC TWIN-CYLINDER ENGINE: When you know the power you need is always at the ready, every drive is an enjoyable experience. And that’s precisely what you get out of the class-leading 999cc liquid-cooled inline twin. Using the same Unicam® cylinder head design found in our motocross bikes, it’s more compact in size, and it still delivers the kind of horsepower and torque you’d expect from a flagship model. FULLY-AUTOMATIC SIX-SPEED DCT TRANSMISSION: Drive the way you want, with the industry’s first and only 6-speed Dual Clutch Transmission. Choose between manual mode or fully automatic. Plus, the addition of Sport Mode increases the fun, shifting at higher RPMs for a spirited, full-performance driving experience. HIGH / LOW SUBTRANSMISSION: With a full 42-percent gear reduction between High and Low, you get the torque you need in all 6 gears. It comes in handy when driving over difficult terrain, scaling steep hills or towing heavy loads. 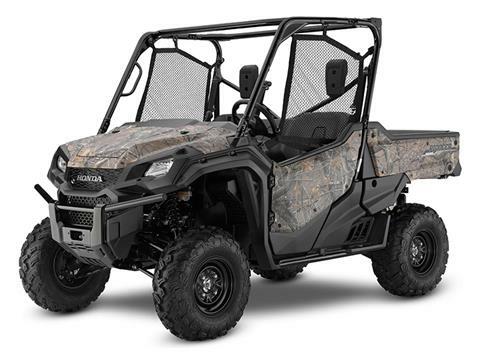 BUILT IN THE U.S.A.: The Pioneer 1000 is purpose-built for the American market, right in America. Domestically and globally sourced parts are all assembled at our plant in Timmonsville, South Carolina, and once these side-by-sides roll off the line, they’re ready to explore every corner of the country. 2000-POUND TOWING CAPACITY: Call it 2000 pounds, or call it 1 ton. Either way, the towing capacity of the Pioneer 1000 is unsurpassed by any competitor. 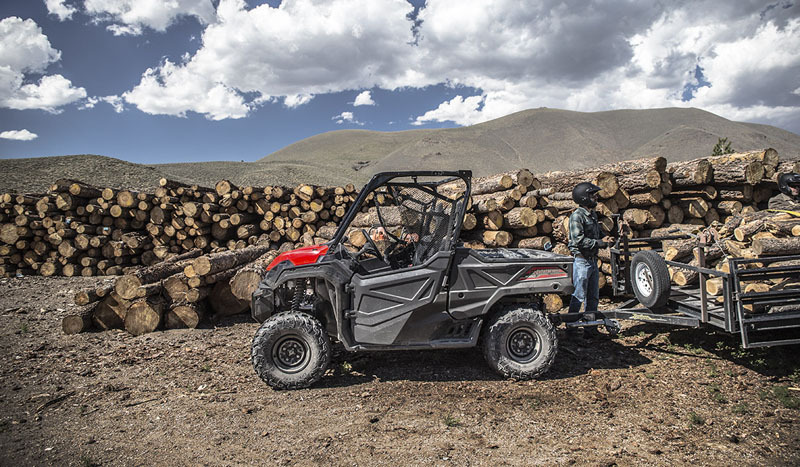 So instead of hopping on the tractor or taking out the truck, you can stay right in your side-by-side and tackle those bigger jobs with relative ease. HILL START ASSIST: Need to stop on a steep uphill? Honda’s Hill Start Assist automatically holds the Pioneer 1000 Limited Edition in position while you move your foot from the brake pedal to the accelerator—there’s no roll-back drama. 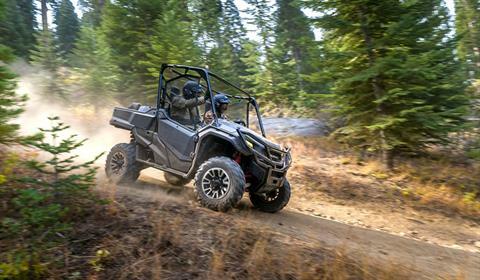 FOUR-WHEEL DISC BRAKES: The Pioneer’s uncompromising power helps take you further than ever before. The reliable disc brakes help you stop on a dime. 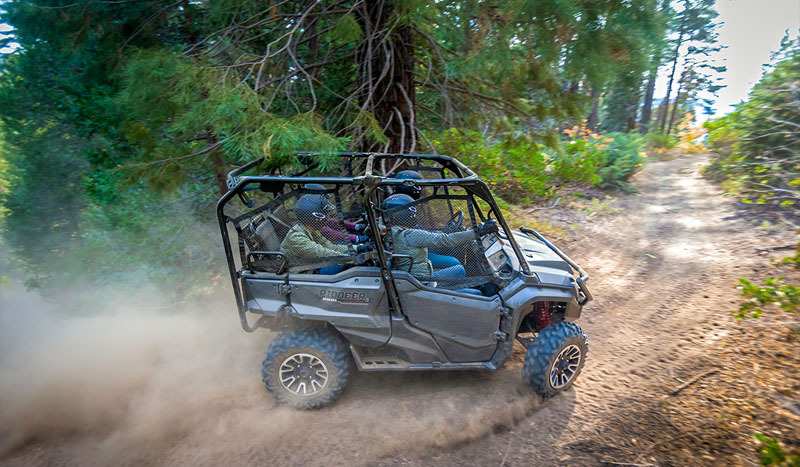 Built to the same standard as you’d find in our autos, the four-wheel disc brakes minimize debris from building up, ensuring consistent performance, and giving you confidence on the trail. 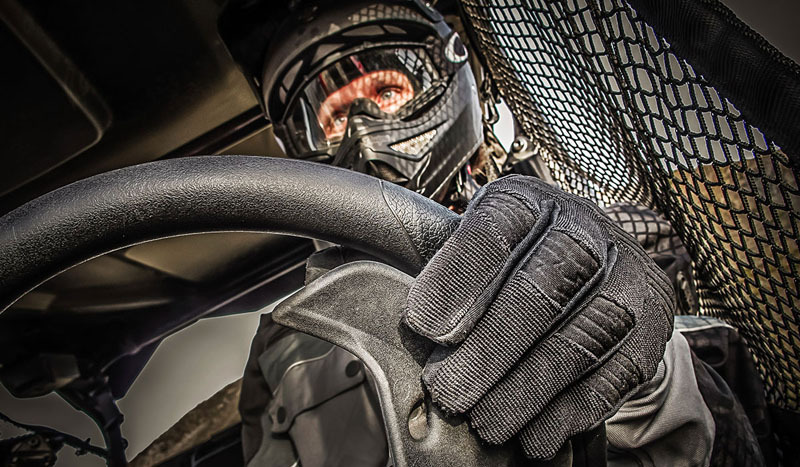 DRIVER / PASSENGER PROTECTION: The Occupant Protection Structure uses large-diameter tubing, and meets OSHA’s rollover protection standard. The hard doors and roll-up side nets help keep debris from entering the cabin, and auto-style three-point seatbelts are equipped with an emergency locking retractor mechanism, to help optimize passenger security. When you put this much safety first, fun is sure to follow. QUICKFLIP® SEATING: Want to bring an extra one or two passengers along for the ride? Two QuickFlip® seats pop up from the cargo bed on Pioneer 1000-5, giving you the extra seating you need, when you need it. Exclusive to Honda, it’s a smarter system than fixed seat, multi-row models, giving you better maneuverability on the trails. ENGINE AIR INTAKE: To get the most out of your engine, you need the best air going into it. That’s why we positioned the air intake up high under the hood. It helps ensure a clean air supply, even at deeper fording depths, and with a new viscous air filter element, you get increased performance and longer service intervals. 1000-POUND-CAPACITY TILT BED: There are a ton of reasons to buy a Pioneer 1000. Among them: the half-ton hauling capacity*. No side-by-side can haul more, and when it comes to dumping, we’ve made it easier than ever, with a hydraulic assist tilt bed lever that can be accessed from outside the vehicle, or right from the driver’s seat. COLOR-MATCH DOOR AND BEDSIDE PANELS: Want to change the color of your Pioneer when hunting season rolls around? No problem. Our door and bedside panels can be easily swapped out for a different color scheme if and when you need it. This feature comes in particularly handy in case a panel sustains any damage on the job or trail. Curb - 1,549 lb. - Includes all standard equipment, required fluids and full tank of fuel.